Why are bottom-club Adelaide's crowds so good? 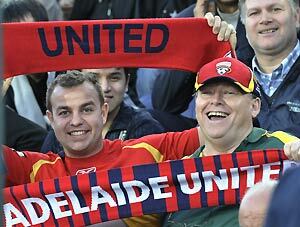 Despite a season of on-field struggle, A-League cellar-dwellers Adelaide United have managed to retain excellent attendances this campaign with an average home crowd of almost 11,000. So I decided to ask Reds Chief Executive Officer Sam Ciccarello how they’ve done it. To emphasise the point of their success, throughout this A-League campaign only the populous centres of Melbourne and Sydney have managed better average crowds than Adelaide. For a club who’ve regularly been amongst the on-field leaders in the A-League (having only missed the finals once when they finished 6th in 2007-2008), the 2009-2010 campaign has been a different one for the fans, yet they’ve still flocked to Hindmarsh. Ciccarello started, “I think it is a cumulative thing in terms of the support we’ve received this year. It’s been outstanding, notwithstanding the ordinary season we’ve had. But Adelaide’s drop-off has been far less dramatic than seen from other A-League clubs in the past, which is amazing considering the Reds have gone from Grand Finalists last season (with average crowds of 11,712) to likely wooden-spooners (where Hindmarsh averages are currently sitting at 10,959). And Ciccarello believes there’s a lot of factors behind those figures, but acknowledges the club’s wonderful journey to the 2008 AFC Champions League (ACL) Final has helped greatly. “We believe our extraordinary successes, even though we didn’t win the Champions League, gave us a platform in 2008 to be able to connect with our community, not just the sports community or the football community, but the general public in a different way,” Ciccarello said. On the back of that, he claims had the club achieved their minimum on-field expectation of a top 4 A-League finish this campaign, the attendance figures could be even more impressive. “We’ve got record memberships this year. The signs were very strong, especially during the early part of the season. But we haven’t been able to deliver on the expectation that we set ourselves and that we promised our fans. But Ciccarello believes there’s more to the figures than just their 2008 ACL campaign and points to several key initiatives employed by the club over the last two to three years, which have ensured they’ve been able to engage with the local community and develop a core group of loyal supporters. “Part of why we are where we are is, we believe, that one of the main pillars of our organisation is to ensure that our connection and relationship with our community is very active and a meaningful relationship. There are a number of key parts to that. Ciccarello mentioned several initiatives with community engagement at heart, including their rebate program whereby anybody who buys a membership can direct 25% of those dollars back to their local club. It has seen United distribute over $70,000 to local clubs. The Adelaide CEO also mentioned other initiatives such as their strong membership drive, academy program and their warm relationship with the media as reasons for added local interest in the club. And Ciccarello revealed the club got plenty of positive feedback following their membership drive which included the popular Friday Night Shout, which allows members to bring four friends free of charge to any match subject to subscription. Adelaide have also enjoyed hosting eleven of their fourteen home games this season on a Friday evening and Ciccarello acknowledged that has contributed. “What we’ve found through past experience and member feedback is that Friday night is the most popular night to maximise match attendance. People love going out on Saturday nights, but there’s a lot of competition in terms of other offerings. And Ciccarello indicated he wanted more Friday night games in Adelaide for next season and beyond. The Reds CEO also acknowledged the intimacy of Hindmarsh, the A-League’s smallest capacity stadium, may have helped create a better atmosphere and gameday experience.